If you are considering giving up your pet, we encourage you to try some of the following ideas to re-home your pet and use HSSM only as a last resort. There are several steps you should take before seeking a new home for your pet. The following tips are intended to assist with re-homing pets that are spayed/neutered ONLY. Have your pet spayed/neutered. Spaying/Neutering your pet deters individuals seeking pets simply for breeding purposes to make a quick buck. It also increases the chances that your pet will settle in with the pets in a new home. Spay/Neuter is affordable for everyone please refer to HSSM’s Spay/Neuter Pricing Guide and call 228-863-3354 ext. 3829 or 3830 to book your pet’s appointment. Gather all of your pet’s records. Registration papers, Veterinarian records, and any other documentation you have for your pet will help his/her new owner. Make sure you have these ready for your pet’s new family. Be transparent about the reason you are giving up your pet. If you are giving up your pet because of behavioral or health reasons, make sure you are honest and open about those problems. Better yet seek assistance for behavioral issues before re-homing… you may even end up fixing the original problem and keeping your pet! Many local pet retail outlets offer obedience and manners classes. Start with family, friends and co-workers. Re-homing your pet to someone you know may be easier than you think AND it will help you feel more comfortable that your pet will be well taken care of. Send out e-mails, post in your workplace, or simply bring your pet up in conversation. You never know who is looking for a new pet! Make re-homing posters that can be used throughout the community and online. You can download HSSM’s sample poster here. Take advantage of bulletin boards throughout the community as well as online sources and classified ads. Use a high-quality, recent color photograph of your pet on posters and online sources. This is Blanca, successfully re-homed using HSSM’s tips! Ask for a re-homing fee. Most people who want a pet for the right reasons are happy to pay something for the animal and a fee will discourage most people who have malicious intentions. Interview Potential New Homes Carefully. Check out HSSM’s Perfect Match forms (for dogs) (for cats) here for examples of what types of questions to ask. Verify the New Owner’s Information. Do a little bit of digging to make sure you have the whole story. Take the time to review multiple applicants to ensure your pet gets the best new home possible. Verify the name and address with a driver’s license. Call the person’s landlord and make sure he/she has permission to have a pet. Ask to see the person’s veterinary records on all his/her current or past pets to see if he/she takes care of their animals. Get references (friends, neighbors), and call to see if they can vouch for the person’s ability to care for their animals. Follow Up. Call or e-mail to check on your pet periodically. 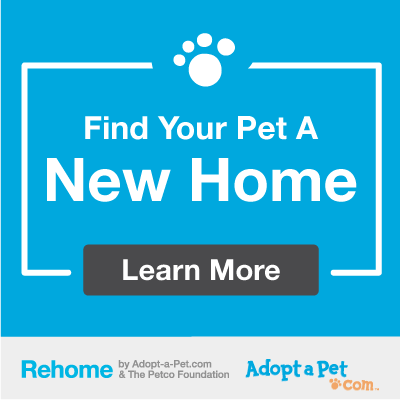 Creating a relationship with your pet’s new home can be a great way to feel comfortable with making the decision to re-home your pet. We wish you the best in re-homing your pet! However, if you have exhausted all of these means to re-home your pet and you still need to surrender your pet to HSSM, click here for information on HSSM’s Surrender process and what to bring with you.